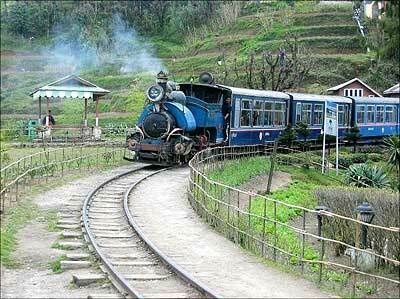 Light Railway of Jagadhri was inaugurated on 11th August 1911. It continued till around 1950 when it stopped operations .Coming of Motor Cars / Buses / Trucks made the Light Railway lose its economic viability . Light Railway used to run between main Jagadhri ( Yamunanagar ) railway station to Matka Chowk ( Gaushala ) ( also , called Chhoti Line in local parlance ) in old Jagadhri town , a distance of 5 km. Gauge of Tracks of Light Railway Jagadhri 2 '.i.e. 610 mm ( equivalent to Darjeeling Himalayan Line ). The main line ( broad gauge ) was under NWR ( North Western Railway ). Main station broad gauge line connected most important cities like Howrah ( Kolkata ) and Kalka , Mumbai and Amritsar , Lahore and Landi Kotal ( Peshawar ). VIP trains of those times like the Frontier Mail and Kalka Mail passed ( and still do ) through Main Jagadhri station. Yamuanagar before 1947 was known as Abdullapur. When the railway started , on the first day of its operation there was free Joy Ride for all. Around 1930 the fare was one anna. ( One Rupee = 16 annas ). The top speed of the Passenger trains was around 15 KM / Hour . It took 20 to 25 minutes for one way 5 Km journey. There were a couple of manned railway crossings ( Phataks ) and a couple of Halts en route. At Jagadhri Terminus , goods could be booked even for connecting destinations of Broad gauge ( example from Jagadhri town to Kolkata ). Railway Receipt ( RR ) were issued . Similarly , composite passenger tickets / reservations were available for onward Broad Gauge destinations in India. The Light Railway was a privately owned enterprise ( by the Raja family of Jagadhri ) named " JAGADHRI LIGHT RAILWAY COMPANY LIMITED ". .. The Jagadhri Light Railway Company, Limited, was a joint stock company having its ... It had a fully paid-up capital of Rs. 1,20,000 divided into 600 shares of Rs. 200 each. There still exists a ( Light ) Railway Bazar in Jagadhri but no railway station or railway line. The line has gone and so have gone nearly all the traces of the railway line. After Main Radaur Road Railway Crossing ( Phatak ) at Yamunanagar , the rail track entered the compound of the Paper Mill ( it passed through the front open ground of the Paper Mills. There was a Phatak within the Mill. After leaving the Paper Mill , the track more or less , ran parallel to the Main YamunaNagar ( Railway Station ) -Jagadhri ( Chhuchhrauli ) Dual Road . After closure of the Light Railway its track was removed and the alignment was converted to a Road. Old Jagadhri Terminus. There was a marshalling yard for goods train ( where loading / unloading was done ) and a Turntable / Wheelhouse ) for turning the sides of the engine.